bluecowproducts has no other items for sale. Ducky One 2 Mini RGB 60% Keyboard Cherry MX Silent Red TFUE SAME DAY SHIPPING!! 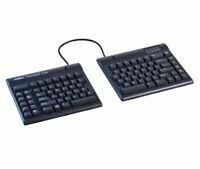 Kinesis Freestyle2 Solo Keyboard A traditional but compact key layout makes adaptation a breeze, but that's where traditional keyboard design ends. The Freestyle2 consists of two keying modules connected together by the flexible Pivot Tether, which allows infinite adjustment of the front opening angle (splay). Removing the Pivot Tether allows the two modules to completely separate up to 20"" inches, accommodating a range of shoulder widths Driverless hot keys replacing mouse-intensive actions, Low-profile design to promote neutral wrist posture, Narrow footprint allowing closer reach of a mouse, and embedded 10-key with status LED. 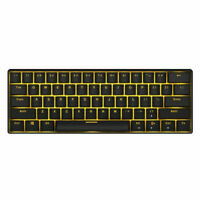 A separate 10-key is available, USB compatible. This is my ideal keyboard. I am a professional transcriber. My work involves lots of typing. So I was looking for an ergonomic keyboard. 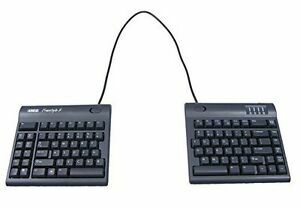 I did online research about different ergonomic keyboards out there in the market. I was considering: Microsoft 4000 Kinesis Maxim Goldstar But this one stands out from the others. Its most striking feature is that it is split into two. I don't do much typing at all on a computer desk with a keyboard tray in it. I do most of my typing sitting on a sofa with the keyboard in my lap. So I took a piece out of cardboard so that I could place this keyboard on it, and I place the two split pieces as far as possible, and I type. The keys are very low-force. So I don't have to exert at all while typing. The Fn key and the special keys don't work in Linux that I use. One thing I don't like about it is that the function keys (F1 - F12) are not grouped into 4 like how conventional keyboards have them. That is a bit inconvenient when you want to perform certain tasks in a software using them. And so far I don't need any accessory for this, like V3 and VIP3. It is fantastic without them. I'm just hoping I get used to this. The home keys is too close to the delete key so I inadvertently go to the beginning of a sentence when I want to delete a letter. The up arrow key is too close to the shift key. They should have made the keyboard 1/2 inch wider so they could place some space between the navigation keys on the right and the main keyboard area. I bought this used so I can't sent it back. This is my 2nd Kinesis keyboard and I couldn't live without it. Fingers too scrunched together on a regular one. Great if you do a lot of typing! I own my own business and due to the type of work I do my keyboards (and my arms, shoulders, hands, and fingers) get a heavy workout. I started using this keyboard years ago and I'll never use anything else. Best ergonomic keyboard out there, IMO.